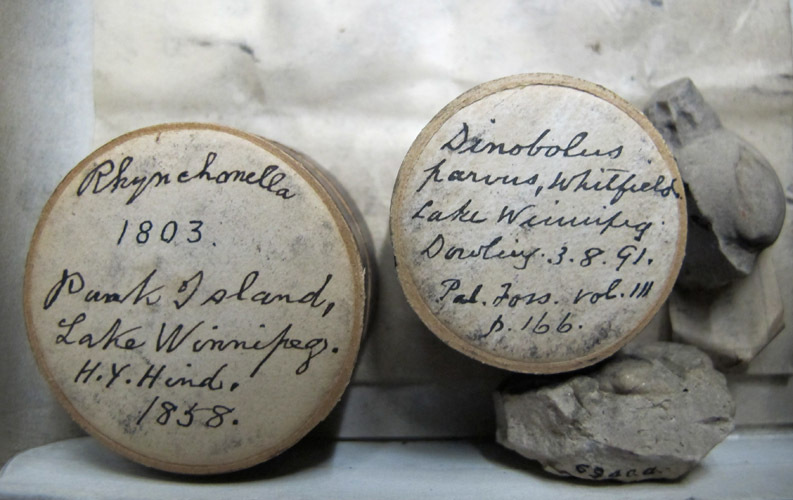 Hand-labelled nineteenth century specimen boxes record early scientific expeditions to the Lake Winnipeg area. I just heard this week that a friend is very ill. This friend has not been “in robust health” for a quite some time, but still had been managing in an “I’m alright, really” sort of way. Now it seems that there has been a sudden turn for the worse, and I am fearful about my friend’s future. We have not heard anything about it being terminal, but still, the prognosis is far from favourable. This news has made me think about our relationship; I guess I have tended to take this friend too much for granted. But we have had such conversations in the many happy hours we have spent together … such wonderful conversations! For you see, my friend is very old, quite remarkably old. My friend has memories going all the way back to the 1840s, back to a time before there was even a country of Canada. And since those memories started, my friend has been everywhere across the northern half of this continent. Literally everywhere, to many places I have not even heard of. And every place holds some special precise recollection of our nation’s distant and historic pasts. I have listened carefully while my friend has told me about the life forms of ancient tropical seas, and about the almost superhuman scientists who traversed this country before the days of paved roads and airplanes. Long before we visited Inmost Island, the GSC's intrepid T.C. Weston had been there! This is an Ordovician alga (seaweed). I’m sure you are more than aware by now that the friend I write of is not human. 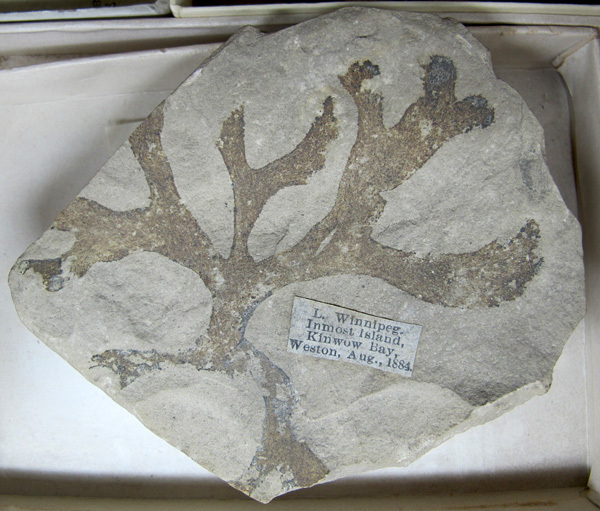 This friend is a collection, the National Type Fossil Collection and the bulk fossil collections of the Geological Survey of Canada. 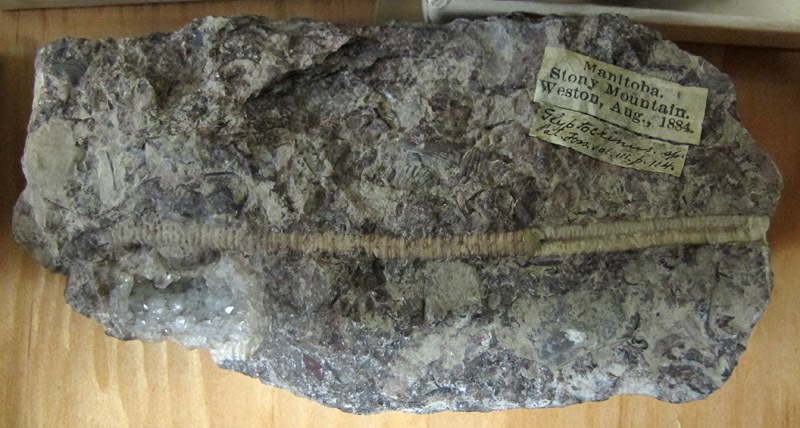 This collection is one of the most remarkable and little-known institutions of this country: a huge assemblage of fossils that has been built up through the work of many superb scientists over the past 170 years or so! It not only represents a physical record of geological field research in this country and a reference for those wishing to understand past work; it is also a fantastic resource for scientists, both at present and in the future. This collection forms an immense body of raw material for scientific study, painstakingly assembled at what would be, cumulatively, a tremendous cost. I worry about this collection because news has just come down that the Federal Government’s current round of budget cuts will be affecting its curatorial staffing. And that is a serious concern. Certainly much of the collection is in good shape, so perhaps it may look to some managers as though they should be able to just close the door, opening it occasionally to allow access to trusted scientists. But a collection is a living, breathing organism that requires constant care and feeding; you cannot simply assume that it will be fine on its own for a while. 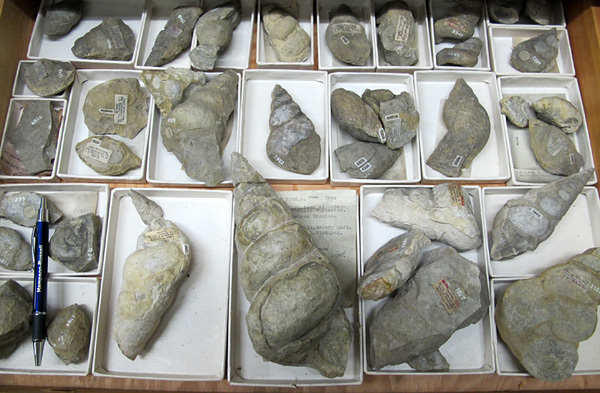 It will deteriorate: specimens will become separated from their labels, boxes will fall apart, entries in the catalogue may no longer have corresponding fossils in the drawers. Without care over a longer term it might become useless, a candidate for the Ottawa landfills. 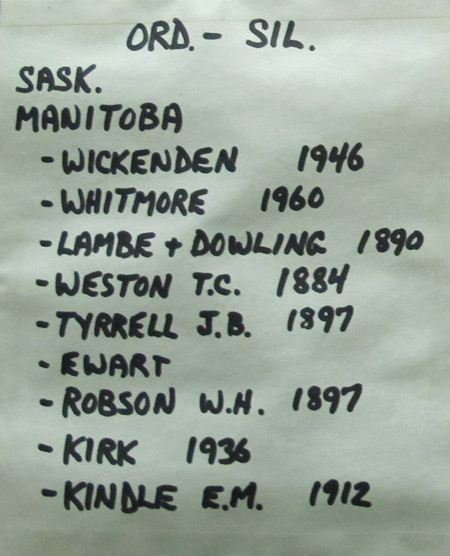 The label on a cabinet door is almost a "who's who" of historic collectors in western Canada. This collection has been built on trust, with each generation’s new collections being added to the existing body, and all of it passed down to the future. 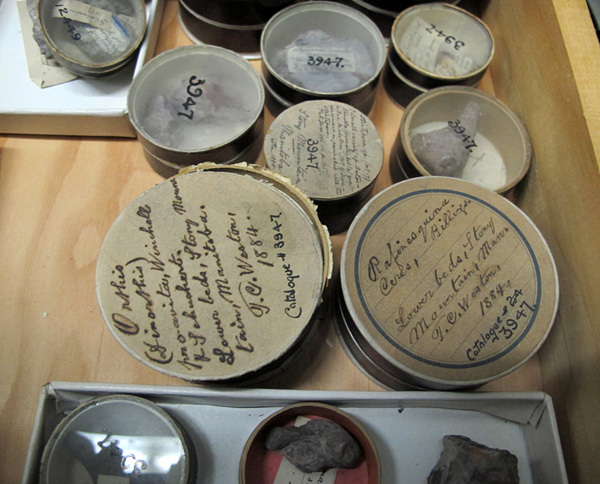 At a time when our government is focused on the discovery of new resources, and when biostratigraphy (the time -significance of fossils) is useful for finding really practical things like sediment-hosted base metal deposits, it would be extremely sad to see this wonderful reference library of geological objects fall slow victim to entropy, dermestids, and decay. 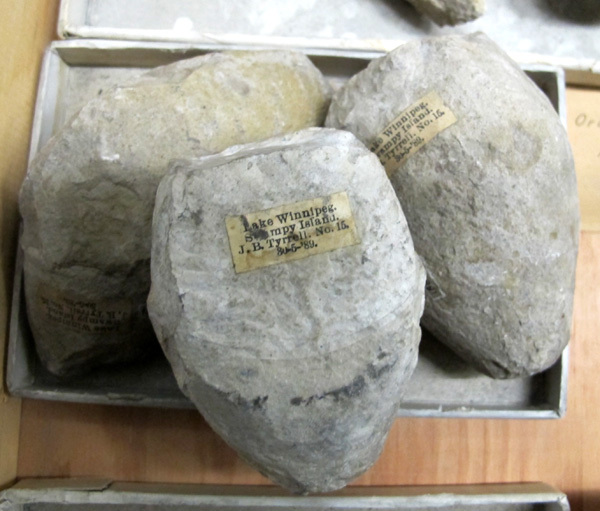 These beautiful little boxes hold brachiopods collected by Weston from Stony Mountain. Beautiful images of a most intriguing collection. When CBC was in previous cost-cutting mode (when wasn’t it, since the 1990s? ), they threw tons of old tapes into the dumpster at CBC Ottawa. No money to archive, no space. No good reason to save… So thousands of local moments went to landfill. When Harry Elton died, they had no footage. I think that is always a risk with cost-cutting – it is easiest to cut those things that only a few people might notice in the short term, even if those are vital long-term resources that should be kept as a perpetual trust. It is so frustrating to watch our government systematically dismantling the institutions of this country. It will take decades to repair the damage wrought by the actions of a few deranged ideologues, and in some cases the damage will be irreparable, such as the nearly two centuries of accumulated knowledge that could be lost if the GSC collections are not properly maintained. Imagine, if the GSC collections don’t have a future… what will become of the future of smaller institutions !?! Mario, I hope it isn’t quite that bad. But it does look as though there will be much less curatorial support there than there has been (and it was already not overstaffed, and got few resources, though Jean and Michelle have done a fantastic job). It is a sad reflection of the priorities of the day and this Government. While not of the scope of the GSC collections, university collections are in dire straits too. A provocative thought, and perhaps unkind, but given the religious beliefs of some members of the Federal CP caucus (i.e., young earth creationism), I am left pondering whether benign neglect has another purpose – get rid of those annoyingly inconvenient fossils. Just like their actions to shut down data-gathering on another ‘inconvenient truth’. David, I hadn’t even thought that way about it. Maybe the fossils are inconvenient, but I am sure their utility as a tool for finding resources must, among tories, overcome any “embarrassment” they might cause creationists. Sometimes, one only starts to value people and things around him that he takes for granted when this person is in some sort of trouble, whether health or financier. Years ago I suffered from some symptoms that affected me bodily and mentally. I started to value people, treated them as friends from afar even though I see them everyday or most of the time. I started to tell people things that I would not have told, or would have “waited” forever for “chances” to tell, eg.s, “I love you”; “I am sorry, you are actually great, its all my fault”; or even pointed out a person’s mistake with a view that the individual may change. I thought I had heart attack, I had pain in the chest and stomach, at times, severely, I also thought that I was suffering from something very bad, I thought I was going to die. It was not until it got very serious that i went to see a doctor. Oh, thank god, it was just a so called “civilised illness” – gastric and flatulent. Thanks for bringing this to my attention – I will pass it along. Also; it’s wonderfully written! Great way to add a human element to the problem, Graham. There are already so many issues with this conservative majority. These are sad times, indeed. Holli, thank you for your comment; these are complicated times. I hope things are going OK with the new job and all! A beautifully written and illustrated post, thanks for sharing this story – such remarkable things, I do hope they can be properly taken care of. Sad to hear. Unfortunately just about everyone I know here in the states who work at similar institutions are wrestling with the same situation. Plenty of money for hedge funds but no money for that which fuels our spirits. very nice blog. thank you. Art, thanks for your comment. We seem to be going through major change in the way our world functions, and a lot of it is not for the better, sadly.